Casa Colibri in Sayulita, Nayarit Mexico, is a beautiful, spacious, custom-built villa. The property is a 5 minute easy walk from the heart of the village and the main beach, yet offers a private and peaceful jungle retreat. Casa Colibri captures all the beauty and uniqueness Sayulita has to offer. You will enjoy gorgeous, wave crashing views of the ocean from the casita and pool, lush green mountains beyond, and the surrounding jungle with beautiful hillside homes. Buena Vista, our 2 bedroom casita, has its own private entrance, large terrace with dining table for 6 and chaise lounge chairs, overlooking the bay of Sayulita, the jungle, the pool, and our beautifully landscaped gardens, providing indoor/outdoor living in a lush garden setting. The casita is very private with a separate walkway from a cobblestone street located in a quiet residential neighborhood. The décor is tasteful and authentic and the casita offers all the amenities to make your vacation easy and comfortable. The 1000 sq ft home surrounds a large terrace overlooking ocean, beach, and jungle views. The two spacious and airy bedrooms have views, comfy king-size beds w pillow top mattresses, 100% cotton linens, and air conditioning. They are situated at opposite ends of the casita, with the living room and kitchen in the center, to optimize privacy. Each bedroom has its own large bathroom. One bedroom has handcrafted french doors opening to the terrace, the other has a sitting area with views of the jungle. One of the bedrooms can also be arranged with two twin beds if desired. We have a housekeeper here 3-4 days a week to keep your casita fresh and tidy. Enjoy tasteful decor collected from our travels in Mexico, colorful tile and art, and comfortable furnishings throughout. The open concept living room/kitchen has French doors to a spacious terrace with a palapa shaded dining table for six and chaise lounge chairs. The pool is just steps from the terrace. The kitchen has a center island w seating and is fully equipped with cookware, appliances, and everything else you need to prepare a fabulous meal. There is a propane bbq on the terrace where you can relax with a margarita, grill your catch of the day, and watch the sunset. The grounds of Casa Colibri are beautifully landscaped with walkways and terraces winding through an assortment of exotic, fragrant, flowering, tropical plants and trees. We are under a jungle canopy and enjoy a wide variety of exotic birds, iguanas, and butterflies. Enjoy refreshing ocean breezes blowing through the windows and across the patios. Casa Colibri is situated on a quiet and charming cobblestoned street in a safe residential neighborhood. Our street, which is under a jungle canopy, welcomes visitors with birds chirping, iguanas resting in the trees, and neighbors walking their dogs. It is friendly and inviting. Beautiful flowers and tropical foliage abound. We are just south of town and an easy 5 minute walk to the central plaza and all the shops and restaurants, the main beach and surf break. We are also close to a stunning jungle trail that winds out to Playa los Muertos, a quieter, more remote swimming beach. It is truly an ideal location. Private and quiet yet close to all the action. Our property is walled and gated, and offers a secure, peaceful spot to retreat at the end of your day. An easy 5 minute scenic stroll down our cobblestone street will take you to the beach and village, where there are awesome restaurants offering simple to gourmet, including American, Asian Fusion, Italian, French, and of course, delicious Mexican and seafood dishes. The shopping in town is fun with unique jewelry, clothing, home décor, art galleries, and handmade items from all over Mexico. Spa treatments abound in several locations in town. And if you want some adventure during you stay there is surfing, fishing, horseback riding, ATVing, jungle hiking, and zip lining, all for which Sayulita is famous. A stay at Casa Colibri encompasses all Sayulita has to offer at a great value! Additional information is available from your hosts, Joan and Dave on request by e-mail (see below). In 2013 we quit our jobs and sold our home in San Diego to fulfill our dream of retirement in a Mexican seaside village. We did our research, and decided Sayulita had all the qualities we were looking for. Authentic and quaint, yet lively and fun, a great surf break, stunning natural beauty, and a very friendly, safe community of locals and expats. After quite a few house hunting trips, we narrowed down our search to the south end of Sayulita. We wanted an exceptional home for our guests and ourselves, easy walking distance to town and the beach, with ocean and jungle views. When we toured Casa Colibri, we knew this was home. 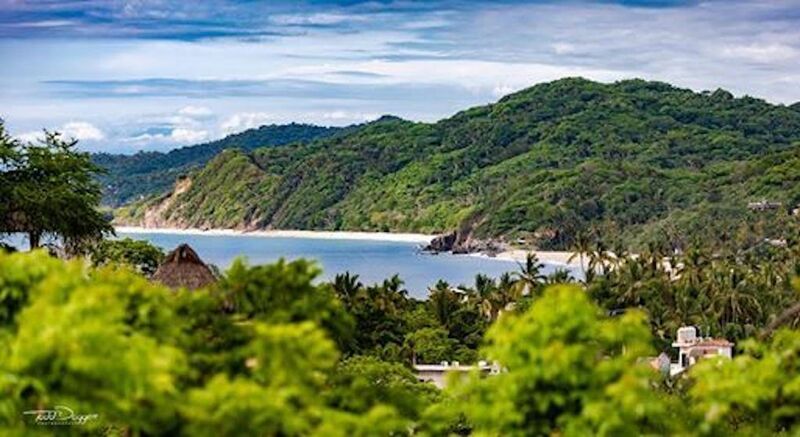 It is truly a special place that provides all Sayulita has to offer, beautiful views, easy access to town and the beaches, and tasteful, casual comfort. Casa Colibri is located in a lush, colorful, garden setting overlooking Sayulita's beautiful bay. It is on a cobblestone street in a neighborhood that is private and quiet, yet close to all the action at the beach or in town. The décor is tasteful and authentic with all the amenities to make your vacation an exceptional one. toilet, shower, Roomy, with vanity. Clean and spacious bathrooms with very large showers, attached to each bedroom. Colorful Mexican tile in all. 5 min walk from casita. Ocean, beach, and jungle hills. Access to internet phone line. Quiet A/C in all bedrooms. High quality sheets and towels. All open to kitchen and patio overlooking the ocean jungle, and/or gardens. Beautiful garden setting. Tasteful, comfortable décor. Paper towels, napkins, coffee filters, oil, vinegar, basic spices. All you need to prepare your meals. Fully equipt kitchen open to living room and patio area, with view of the ocean and gardens. Very functional and stocked to prepare a lovely breakfast, lunch, or dinner. Filtered water provided. Dining table for 6 in Buena Vista Center Island in kitchen, as well. Beach toys, boogie board, chairs and umbrellas are provided. The gardens surrounding Casa Colibri are lush and filled with tropical flowers, birds, and butterflies. Very spacious terrace overlooking the bay, lush hillsides and gardens. Boogie boards, foam surfboard, beach chairs, and umbrellas, beach toys for little ones. Beautiful pool with gorgeous ocean and jungle views. Bbq, comfortable chaise lounge chairs and dining table for 4 w umbrella. We can provide names for recommended shuttle service, area attractions such as surf schools, sailing and fishing expeditions, personal chefs, and other interests. We loved our time at Buena Vista. Dave and Joan were very helpful and wonderful to visit with. The property was clean and well decorated and is a short walk to all the action. When we go back to Sayulita we will definitely stay there again. This is a beautiful and well maintained property in Sayulita. Away from the bustle of downtown, but a very short walk to get there. The 2 bedroom casita had everything we needed. We enjoyed relaxing by the pool and on the terrace when we weren't out exploring. This property also has 2 1-bedroom casitas. It would be ideal for a bigger group. Each casita has privacy but there is common space for all. Joan was helpful arranging airport transpotation, golf cart rental and providing local information. It was easy to communicate with her. My wife and I spent 4 nights at Joan and Dave’s casita. The casita is beautifully finished and has all the amenities necessary for a great vacation. Whether you want to stay in and cook, enjoy the pool or use it as a home base, it has it all. Joan and Dave were great hosts, arranging an airport shuttle and a golf cart for part of our stay. Sayulita was amazing and our stay here was a big part of the experience. Joan and Dave were exceptional hosts, loved our stay in the Sayulita area. This was our first time and will not be our last. Thank you for a wonderful vacation. Hi Michelle, thank you for your kind words. You were great guests and we hope to see you again sometime soon! We are so happy you had a good time. We hope to see you again! Native Village Life, Internet Access, world-class Yoga, Zumba, Salsa, beach aerobics. Pet friendly in most cases.